Our Managed Print Services, from Star Managed Services, helps businesses to best utilize their existing printers and multi-function systems. Optimize your productivity backed with a usage-based support agreement. Our team of professionals will help you direct the right print output to the correct device for the job. We ensure the highest productivity with the lowest total cost of ownership, no matter which brand of devices you use. Our administered Managed Print Service programs provide an immediate and measurable cost reduction. Many companies have no idea how much they spend on document output each year. It can come as quite a shock to learn that printing expenses can add up to 3 percent of your annual sales revenue. 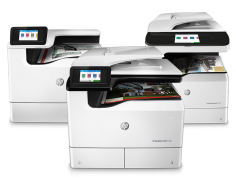 Printer fleets are one of the most overlooked and under-managed assets in any business. Waste and hidden costs are substantial and detrimental to your bottom line. Our accurate controls and measures set within your print environment prevent that. Unmanaged & Unmeasured Expenses: The average business spends between 1-3% of their annual revenue on printing alone. Many businesses do not have the proper tools in place to reduce these costs wherever possible. This means that as printing costs go up and print demand increases, businesses will continue to overspend on printing each year. Managed Print Services helps businesses to regularly track real-time data. This allows you to identify the best ways to reduce costs throughout your office. Unmanaged Inventories: Many businesses will overspend on toner cartridges. That can cost upwards of a $100 or more! Rather than risk running out of toner, businesses will oftentimes order more cartridges than they need. This creates an immediate expense without a corresponding benefit. Pair this with improper management of print assets, and you can find yourself with a significant stock of unmanaged toner, unnecessarily purchased and costing your business. Managed Print Service’s monitoring tools reduce the need to stockpile supplies and eliminates the risk of running out. Ensuring you always have the supplies you need, when you need them most. Diversion of IT Resources to Printing Problems: Even the highest cost employees get removed from highly profitable projects every time a printer stops. This is likely due to network and server maintenance. Our Managed Print Service programs provide our customers with the helpdesk support and on-site service. This allows your IT to focus on their core projects for your entire print fleet.